Posted by Strange, Austin M. , Fuchs, Andreas , Dreher, Axel , Parks, Brad , Tierney, Michael J. Some Western commentators portray Beijing’s aid flows to developing countries as motivated by a desire to prop up corrupt ruling elites, secure access to natural resources, and gain overseas footholds for Chinese firms. This column reports research showing that reality is far more complex and nuanced than this “rogue donor” narrative. Rigorous evidence on China’s overseas development programs reveals many positive effects – for example, boosting growth and reducing the likelihood of civil conflict. But it is important to note that the majority of China’s official financing flows are less concessional and more commercially oriented than traditional aid. The coherence and stability of the global development finance regime is in jeopardy. Brazil, China, India, Russia (the BRICs), and Saudi Arabia account for a growing share of global aid flows to the developing world, but they are not bound by the behavioral norms and best practices adopted by the OECD’s Development Assistance Committee. Similarly, they do not adhere to the information disclosure standards of the OECD or the International Aid Transparency Initiative. These “emerging” donors and lenders also provide new types of financial support – such as commodity-backed loans and package deals bundling aid and foreign direct investment activities – that challenge OECD norms, standards, and definitions. These financial flows have potentially far-reaching implications for growth and development outcomes in low- and middle-income countries. Yet analysts and decision-makers have relatively few tools to understand and respond to the rise of non-Western donors and lenders. Consider China, the focus of our research. Beijing has rapidly scaled up its overseas development programs since 2000, provoking speculation and debate about the scale, scope, aims, and effects of Chinese development finance. Some Western policymakers and pundits charge that Beijing uses its largesse to purchase the loyalty of ruling elites in corrupt and authoritarian regimes, to secure natural resources that will fuel domestic economic growth, and to help Chinese firms gain footholds in overseas markets. 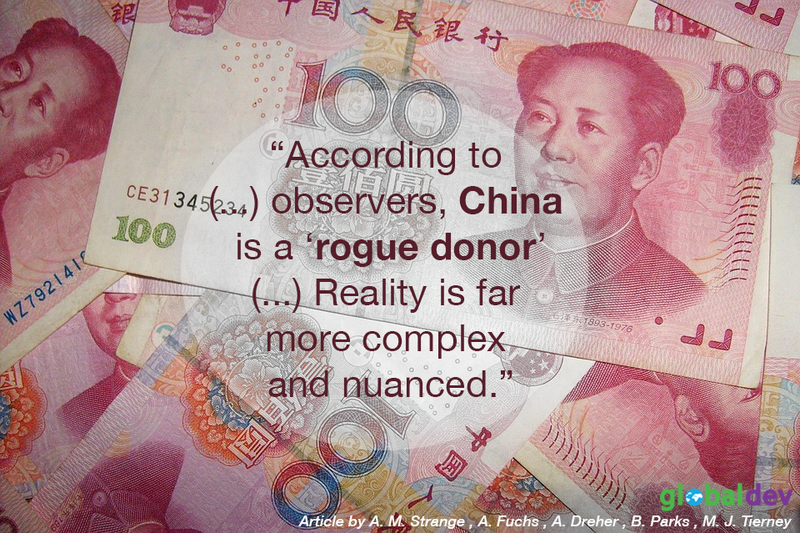 According to these observers, China is a “rogue donor” and its rise threatens not only to upend the needs-based orientation of the global development finance regime, but also to roll back some of the most promising development gains achieved since the end of the Cold War. The problem with this narrative is that until recently, it was not possible to subject these claims to careful scrutiny. Unlike Western donors and lenders, the Chinese government does not publish detailed or comprehensive information about its overseas development activities. Previous attempts by researchers to track Chinese aid and other official financial flows suffered from over-counting, mis-categorization, incomplete coverage, and heavy reliance on individual sources (particularly English language media sources). We have spent the last five years working with AidData to close this evidence gap by developing the “Tracking Underreported Financial Flows” methodology, which enables collection of detailed financial, operational, and locational information about the overseas activities of non-Western donors and lenders. The first empirical application of this transparent and replicable methodology focused on capturing Chinese development projects in Africa between 2000 and 2013. It resulted in the successful identification of nearly 2,600 Chinese development projects and approximately US $94 billion that was not recorded in official international reporting systems. This dataset has also made it possible to evaluate empirically many claims about the purported motivations for and effects of Chinese aid. The emerging portrait is far more complex and nuanced than the “rogue donor” narrative suggests. Our research shows that Chinese aid is indeed vulnerable to domestic political manipulation in host countries: it disproportionately flows to the home and ethnic regions of incumbent African leaders – and even to those of their spouses. We also find that in host countries with weak environmental policies and institutions, Chinese development projects can accelerate the pace of environmental degradation. New analysis (here and here) also suggests that Chinese aid may fuel corruption at the local level in Africa. But on balance, evidence in support of the “rogue donor” narrative appears to be weak. We now know that Chinese aid is no more likely than aid from the US and other Western donors to flow to corrupt or authoritarian regimes in Africa. Beijing certainly does use foreign aid as a tool to secure influence at the United Nations and other venues, but so do Western donors. We also know that contrary to conventional wisdom, Chinese aid does not flow disproportionately to countries with abundant oil and other extractable resources. In fact, Chinese aid tends to go to the most poor and populous African countries. We also establish that Chinese development finance is achieving a number of positive results. In Africa, our analysis of more than 3,000 geo-located Chinese development project sites and remotely sensed night-time light growth between 2000 and 2012 suggests that China is actually electrifying the continent and boosting economic growth at the local level. In short, as the evidence base improves, we are learning that much of the conventional wisdom about China’s motivations and impacts does not survive empirical scrutiny. But we are also learning just how important it is to parse carefully the different types of official financing. Beijing and Washington have provided similar amounts of official finance to Africa since 2000 (see Figure 1). But if only ODA is examined – aid in the strictest sense of the term – it becomes clear that Chinese aid to Africa was only a third of that provided by the US government. The majority of the financing that China’s government provides to the developing world is less concessional and more commercially oriented than traditional ODA flows. This matters because these financial flows tend to go to more corrupt and resource-rich countries rather than poor countries where aid is needed most. If analysts fail to distinguish between different types of financial flows, it may not be surprising that Chinese “aid” is often confused with other types of investments and resource flows; hence our admonition not to “compare apples and dragon fruits”. Going forward, the development research community appears to be increasingly well positioned to provide policymakers and policy influencers with rigorous evidence related to the motivations and impacts of emerging donors. AidData recently released a major expansion of its dataset of officially financed Chinese development projects, covering all major regions of the world over a 15-year period (2000-2014). This dataset, which captures nearly 4440 projects in 140 countries worth approximately $354 billion, opens new opportunities to understand the motivations for and impacts of China’s overseas development program. A parallel effort to geo-reference this dataset sub-nationally will pave the way for targeting efficiency analysis and geo-spatial impact evaluations. Heidelberg University is also leading an effort to build a comprehensive dataset on India’s overseas development program, which will allow for greater knowledge accumulation about the BRICs more generally. Austin M. Strange is a Ph.D. Candidate in the Department of Government at Harvard University. He studies international relations and Chinese foreign economic policies. Andreas Fuchs is senior researcher at Heidelberg University’s Research Center for Distributional Conflict and Globalization. He leads the project “The Economics of Emerging Donors in Development Cooperation” funded by the German Research Foundation. Axel Dreher is Professor of International and Development Politics at Heidelberg University, Germany. He is Editor of the Review of International Organizations and chairman of the Research Group on Development Economics of the German Economic Association. Dr. Brad Parks is Executive Director of AidData and Research Faculty at the College of William and Mary’s Institute for the Theory and Practice of International Relations. Michael Tierney is the George and Mary Hylton Professor of Government and International Relations and the Director of the Institute for the Theory and Practice of International Relations at the College of William & Mary.